The new A-Control washer-extractors offer coin store owners increased revenue generation, easy programming, and tremendous energy savings compared to electro-mechanical models. Customers will be impressed with how easy and flexible the new Huebsch ® A-Control washer-extractors are to operate. Coin store owners can easily adjust and price the wash and rinse cycles individually or globally making these new washers a great source for increased revenue. It offers owners time of day pricing, special event pricing, cycle modifier keys, enhanced audit features, and is capable of interfacing with a portable programming device for easy downloading of programs into machines. Owners will be impressed with the water savings they achieve and the benefits to their operation. The new controls may be programmed to reduce water consumption by as much as 55% per cycle when compared to existing electro-mechanical machines. Reduced water use translates into major cost savings for coin storeowners. The easy-to-use controls and flexibility of the pre-programmed cycles will be a hit with customers. They can add an extra wash, rinse or choose both to create a personalized wash cycle based on their individual needs. Coin store customers will appreciate the large LED display that leads the user through the washing process. A separate start pad makes it even easier to operate. Customers no longer have to wonder when their load will be completed. The new control displays the minutes left before completion. They will now know exactly which cycle they should select for their favorite sweater. Cycle symbols were designed to match garment care labels. Best of all, the display highlights for customers a count down of the time remaining. Customers will also be impressed with how fast their garments are cleaned. The new A-Control washer-extractors are available with coin activation or can be easily interfaced with after market card systems. "These new controls benefit both store owners and customers," said Jay McDonald, Huebsch national sales manager. "Customers gain greater flexibility to tailor their washes and owners enhance their revenue stream through premium vend prices for these extra wash options." 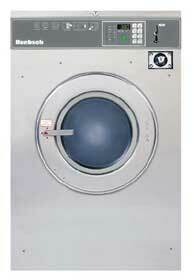 The new A-Control washer-extractors are available in 20, 25, 30, 40, 60 and 80 pound capacities.